900Builder™ Temperature Controller Software for Bulletin 900-TC32 Temperature/Process Controllers provides a graphic configuration alterative to using the controller's on-board keypad and displays. 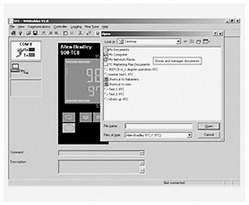 The 900Builder™ Lite is FREE configuration software for Bulletin 900-TC8 and 900-TC16 Temperature/Process Controllers. Reckers, An ISO 9001 Company, is the distributor of Industrial Automation Products, Services and Solution. Reckers was established in 1996. We are in specialized fields of Total Industrial Automation Solutions, Computer Software Development and Engineering Exports. We are an Indian Company headquartered at New Delhi and Operating in Northern states of India. Currently Reckers have Offices at Delhi, Chandigarh, Pune, California(USA) and a Panel Shop at Faridabad.We are the authorized distributor of Rockwell Automation, USA (Allen-Bradley) for their full range of Industrial Automation products including PLC, SCADA software, AC Drives, Soft starter, Vibration systems etc., and also the authorized distributor of Belden India (USA), PANDUIT, Prosoft Technology, Posital FRABA, DATAPAQ, Ross Control India Pvt. Ltd.